Heather and I had the pleasure of presenting this seminar as part of the National Museum of the Royal Navy’s research programme in May 2014. Slides from the presentation are available here. On the 13th of January 1797 shortly after midday two British frigates sighted an unidentified French ship off the coast of Brittany. The frigates, Indefatigable, Captain Sir Edward Pellew, and Amazon, Captain Robert Reynolds, immediately gave chace and by four o’clock in the afternoon observed the ship to be a large vessel with two tiers of guns. She was in fact the French 74 gun ship of the line Les Droits de L’Homme, Captain Jean Baptiste Raymond de Lacrosse, a remnant of the failed expedition to Ireland, loaded with troops, horses and military hardware. At a quarter to five, with “the wind blowing very hard and a great sea”  the chace carried away her fore and main topmast and the Indefatigable lost her steering sail booms. Undeterred, with the Amazon still eight miles astern, the Indefatigable brought the enemy to close action. Although Les Droits de L’Homme carried a significantly heavier broadside, she was hampered by the high sea and unable to open her lower gun ports to bring her heavy lower deck battery to bear. The initial exchange of fire continued for close on an hour until the ships sheared off to repair damaged rigging and clear their decks of debris. At this point the crew of the Indefatigable “saw to their astonishment that their opponent was a line of battle ship but realised that, as they had begun, they must go through with it” . The action recommenced with the frigates placing themselves on either quarter of the harried 74. They “went at her like bull dogs” , raking her with repeated broadsides. On the Indefatigable, “every man was too earnestly and too hardly at work to attend to the run of the ship, the sea was high, the people on the main deck were up to their middles in water; the guns broke their breechings four times over, the masts were much wounded; the main topmast completely unrigg’d and saved only by uncommon alacrity” . Conditions were similar on the Amazon where the men “fought half way up their legs in water, cheering and inspiring courage to all around by their own animated gallant example” . Aboard Les Droits de L’Homme, conditions were scarcely less appalling. The ship’s mizzen mast had been shot away and many of the gun crews had been killed at their guns, but wherever a man fell, “ten sprang up to take his place” . 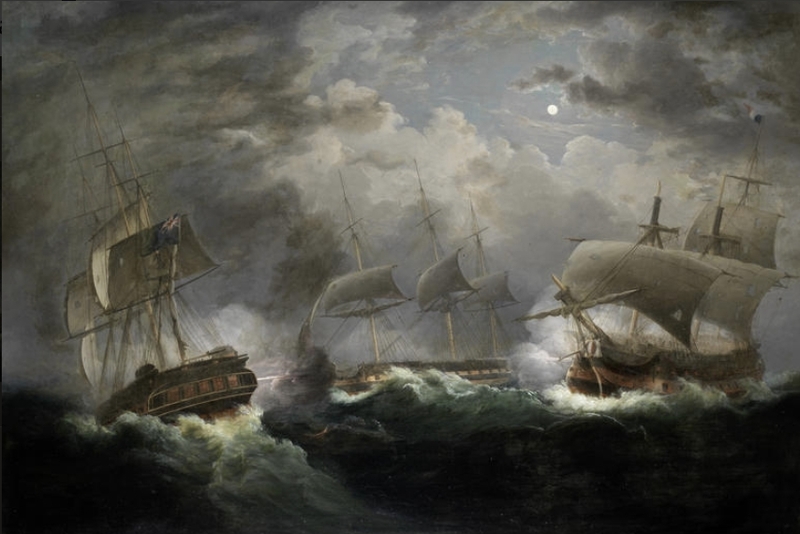 The ferocity of the battle continued for ten hours through the night and the storm, with the French ship running blindly before the gale and never once altering her course while the two frigates hounded her on either quarter. At last, just after 4.00 a.m., the moon broke through the clouds and breakers were sighted close under the Indefatigable’s lee bow. Immediately realising their peril, Pellew made the night signal for danger and the two frigates hauled off on different tacks. Shortly after, they discovered the Les Droits de L’Homme, “the enemy, who had so bravely defended herself, lying on her broadside, and a tremendous surf beating over her”. In her headlong rush for Brest Harbour she had missed her mark and gone ashore in Hodierne Bay. Nor was the Indefatigable’s “situation when day dawned much to be preferred – a gale of wind – a dead lee shore, and an enemy’s at that – a crippled ship – an exhausted crew and the Penmark Rocks, that dread of seamen, to be weathered – these were the difficulties which presented themselves to Pellew as the day dawned” . With four feet of water in the hold, a huge sea running, and the wind dead on shore, the Indefatigable was powerless to help, for Pellew knew that their survival depended on weathering the Penmark Rocks to the south. On the Indefatigable the guns were now silent and every exertion was made to save the ship. Exhausted as they were, the crew set every inch of canvas that could be carried and after four hours of exertion the Indefatigable clawed her way out of Hodierne Bay, to the palpable relief of her captain and all on board. The famous Droits de L’Homme engagement will be familiar to any reader of Georgian naval history or naval adventure fiction. This particular version is compiled from various contemporary and eye witness accounts. The action is still regarded as one of the most iconic frigate engagements of the French Revolutionary and Napoleonic Wars, and Captain Sir Edward Pellew as the quintessential fighting frigate captain of his era. Although the Droits de L’Homme engagement is cited in almost every naval history of the period, little original research has been undertaken about the Indefatigable’s officers and crew, however for the young midshipmen of the Indefatigable, the Droits de L’Homme engagement formed a highly significant point of reference, to which they looked back throughout their lives. Regardless of subsequent naval laurels and public honours, it is notable that almost without exception, it is this engagement that is referred to in their obituaries and memorials up to fifty years later. 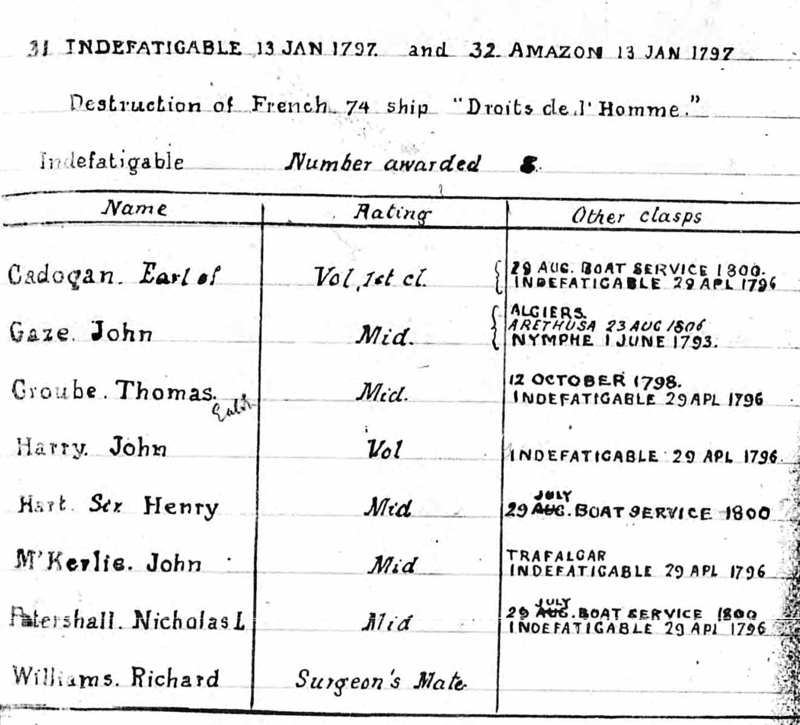 Through detailed examination of contemporary documents, including Admiralty records, public and private archives, genealogical sources, personal correspondence, contemporary journals and press reports, in the UK, USA and France, our research aims to uncover the lives and careers of the midshipmen who served aboard HMS Indefatigable during the Droits de L’Homme engagement, and to reveal their ongoing professional and personal relationship with each other and with their former captain, Sir Edward Pellew. 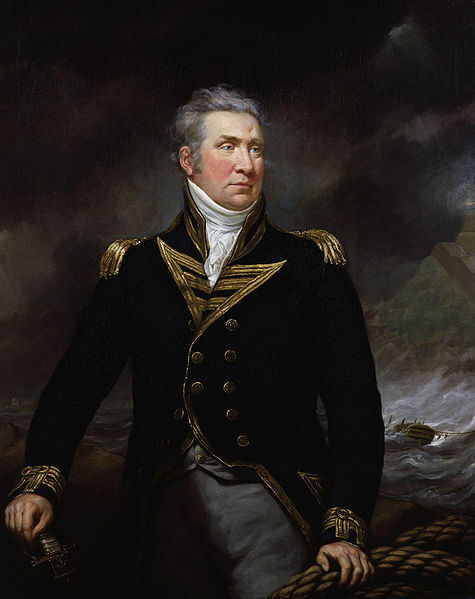 Born in Dover in 1757, Edward Pellew made his name as a gifted sea officer and a daring frigate captain during the French Revolutionary War. He began his naval career in 1770 and first made his mark in the Lake Champlain campaign during the American War of Independence. He served in the Royal Navy for over forty years, eventually retiring from active service in 1822 as Admiral Lord Exmouth. Throughout Pellew’s career he acted as patron and mentor to countless young midshipmen and volunteers and helped to mould many of them into responsible naval officers. Although Pellew rose to the highest naval office, Vice Admiral of the United Kingdom, he is still remembered as the quintessential fighting frigate captain and his name is forever associated with HMS Indefatigable, the 44 gun razee frigate he captained for four years from 1795 to 1799. The title of this seminar, “faithful and attached companions” is taken from a series of letters exchanged between Pellew and Lord Spencer, the First Lord of the Admiralty, in 1799 when Pellew had been informed that he was to be promoted to a ship of the line. This promotion, which was ostensibly a step up the naval career ladder, was long overdue, however Pellew was devastated by the news that he was to leave his beloved Indefatigable and the detached frigate squadron he commanded, for a notoriously insubordinate ship of the line, attached to a fleet led by Admiral Lord Bridport, a man he despised. Among those faithful and attached companions, the boys grown to manhood, were the midshipmen and junior officers of HMS Indefatigable. The twenty young gentlemen included in this study are those who were rated as midshipman on the January / February 1797 muster of the Indefatigable, or those who were among the ships company on the night of the Droits de L’Homme engagement and were subsequently promoted to the rank of midshipman or masters mate, all be it temporarily in some cases. 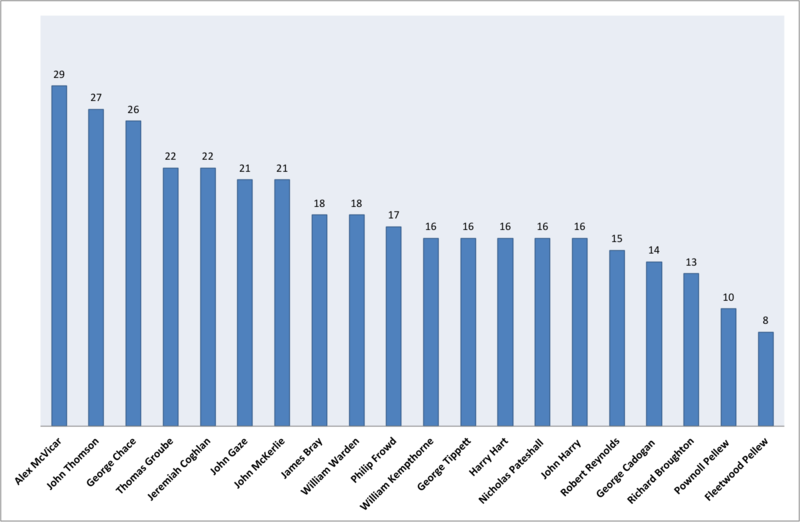 Midshipmen who are listed on earlier or later Indefatigable musters, and those who are named on the January / February 1797 muster, but who were discharged from the ships company before the 13th of January, have not been included in this study. In many respects, these twenty young men are both typical and representative of the junior commissioned officers serving in the Royal Navy at this time. Their ages, in January 1797, ranged from eight to twenty-seven, though two of the youngest, Pownoll Pellew and Fleetwood Pellew, the captain’s sons, appear to have been carried on the ships books in order to reduce the period of active service required before they could sit their lieutenants’ examinations. Though sometimes regarded as an abuse of power, so called ‘false muster’ was common practice at the time and many captains carried the names of the sons of influential patrons or family friends on their muster books. In reality, the youngest junior office actually aboard the ship on the night of the Droits de L’Homme engagement was 13 year old Richard Delves Broughton, a relation of Alexander Broughton, Pellew’s oldest and closest friend and former fellow midshipman. Ten of these young gentlemen had already served aboard frigates previously captained by Pellew; six aboard the Nymphe, and five aboard the Arethusa. Nine began their naval service on the Indefatigable. In terms of their backgrounds, fourteen were English, three were Scottish, one was Irish, though another was descended from Irish stock, and one was born outside the UK, in the British community in Lisbon. 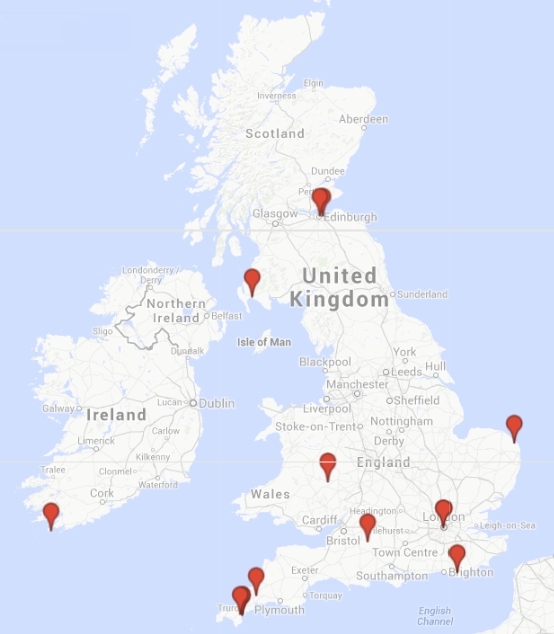 By far the largest distinct group, seven in total, came from the area around Falmouth in Cornwall. Though born in Dover, Pellew’s parents were Cornish and he was brought up near Penzance from the age of eight. Pellew very much identified himself as a Cornishmen, he and his young family settled in Falmouth in 1784 and the port became the home base for the Indefatigable and Pellew’s Western Squadron from the mid 1790’s. For young men aspiring to join the commissioned ranks of the Royal Navy at this time, having an influential patron who could secure a place for them in the midshipman’s berth of a good ship was all important. Families of hopeful boys exploited any connection available to them, whether distant relatives, patrons or family friends. In the case of the Indefatigable, the young gentlemen were no exception, six were the sons of Pellew’s friends and acquaintances, two were Pellew’s own sons, and one was related to his wife. Though justly criticised for unduly exerting his influence on behalf of his own sons and the protégés of influential patrons and political allies, nevertheless Pellew also went to great lengths to support and educate many of his young officers, regardless of their interest or standing. Throughout his career, Pellew had a reputation for nurturing the careers of his junior officers and he tried to instill in all his men a strong sense of duty and service, qualities that are apparent in the careers of many of the young gentlemen presented here. From the perspective of social class, the Indefatigable’s midshipmen came from a wide range of backgrounds and family circumstances. These included the aristocracy, in the case of the Hon George Cadogan who was the son of an Earl, and village craftsmen, such as John Gaze, whose father was a wheelwright in Norfolk. In broad terms, their fathers’ rank or occupation fall into the following groupings: aristocracy (1), mercantile (2), craftsmen (2), the professions (2), packet captains (2), county gentry (4), navy or merchant navy (5), with two whose early life is not yet known. Many of these men were younger sons, such as Nicholas Pateshall who was the fourth son in a family of eight. The navy was a fairly common career choice for younger and middle sons, and the Pateshall family is a classic example of this trend. The eldest son inherited the estate, one entered the army, one entered the navy, one the clergy, one became a doctor and another became a wine merchant. Another noticeable trend among the Indefatigable’s young gentlemen is the number who had already lost their fathers prior to joining the service. At least six out of the twenty were fatherless, and one had lost his mother. This level of parental mortality appears to be typical for the period. However it may also be significant that Pellew, who had lost his own father at an early age and was a devoted, if over indulgent, father to his own children, also took great pride in acting in loco parentis to the young gentlemen under his command. It is striking how many of his men identified Pellew as a father figure, and in letters of condolence following his death, many referred to him as both father and friend. In a moving condolence letter, James Weymss, who served with Pellew in India when he was a young lieutenant, referred to the admiral as “my father afloat”. On joining the Indefatigable, at least five of the young gentlemen had already had some experience of the merchant service. Alex McVicar, from Leith, had previously served in both the Royal Navy and the merchant marine before joining the Indefatigable as one of her oldest midshipmen in 1796. McVicar was already a capable and experienced seaman when he joined the frigate and over the course of his career he transferred between the Royal Navy and the merchant service several times. Pellew made good use of his experienced recruits; he frequently awarded them temporary promotions within his squadron and regularly appointed them to captain prize vessels. At the same time he rewarded their experience by supporting their careers and campaigning for promotion on their behalf. All of the Indefatigable’s young gentlemen pursued a career in the navy, apart from one, John Harry, who left the service while still a first class volunteer, after only 18 months aboard the ship. During this period Harry experienced the Droits de L’Homme engagement and another famous action between the Indefatigable and the French frigate Virgine. Although Harry went on to have an illustrious career as a doctor to some of the crowned heads of Europe, he clearly took pride in his brief but active naval service. Despite receiving many civic honours and awards throughout his lifetime, he did not neglect to apply for the Naval General Service Medal when it was instituted in 1847. Indeed Harry was one of only nine surviving crewmembers who lived long enough to apply for the Droits de L’Homme clasp. Though many of this cohort had modestly successful naval careers, two had the misfortune to be court martialed and dismissed the service. Richard Delves Broughton had a troubled naval career from the start. Letters written between Pellew and his friend Alex Broughton give some indication of the boy’s misdemeanours, though the letters have been heavily redacted by the Broughton family. Broughton was finally courtmartialed for repeated drunkenness, neglect of duty and un-officerlike conduct. He did in fact return to the service as a volunteer on his brother in law’s ship Penelope, before disappearing from the historical record and apparently dying in unknown circumstances in Montana in 1806. Another of the young gentlemen who had a turbulent career was the Honourable George Cadogan. On the surface, Cadogan’s naval career bears all the hallmarks of privilege and patronage. The eighth son of Earl Cadogan joined the navy at the age of twelve, following a recommendation from the First Lord of the Admiralty himself, he made lieutenant at nineteen, commander at twenty-one and post captain at twenty-four. 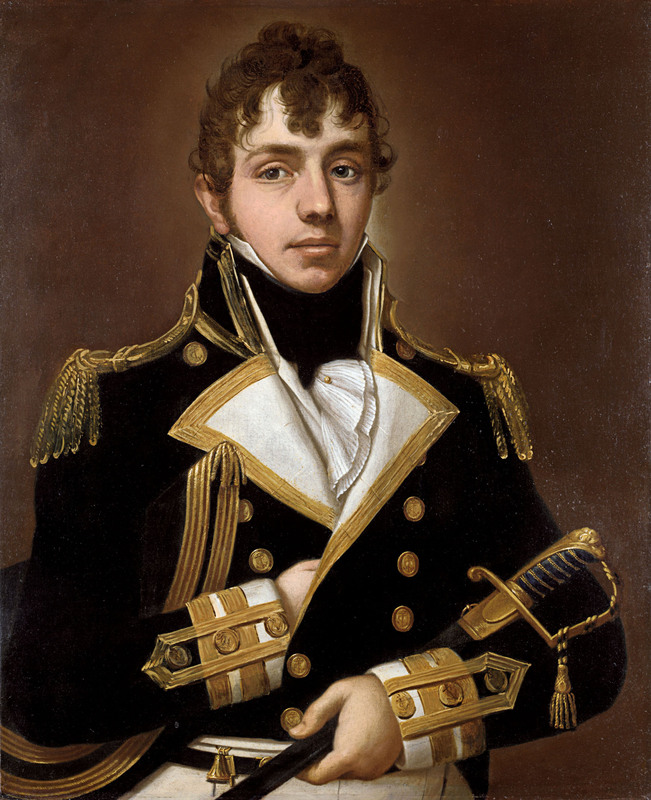 However over the course of five years, from 1804 to 1809, Cadogan endured three courts martial; he lost his first command to the French, quelled a mutiny on his second and, in his third command, he was tried for bringing about the death of a midshipman through tyranny and cruelty. Cadogan was cleared of all charges but private correspondence reveals that he was deeply affected by the courts martial, which took a significant toll on his health. Cadogan’s career did improve later in the war; he retired from the service with honours in 1813 following the siege of Zara and later served as Naval Aide de Camp to two monarchs. Cadogan was the longest lived of this group of the Indefatigable’s young gentlemen, dying in 1864 at the age of 78. Only four of this particular group died in active service, though in keeping with the statistics, only one died as a result of wounds sustained in action. Robert Carthew Reynolds, son of Captain Reynolds, commander of the Amazon and a close friend of Pellew, was killed in Guadeloupe in 1804 at the age of 21. Reynolds was seriously injured in a cutting out expedition at Fort Royal harbour partially designed to deflect attention from the British Navy’s fortification of Diamond Rock. 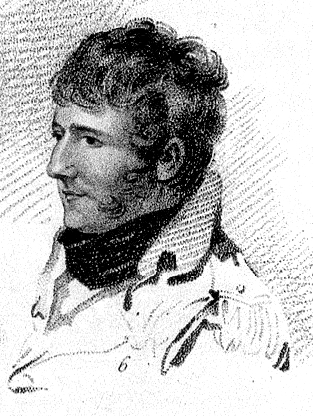 Reynolds succeeded in securing the prize, the French brig Le Curieux, and returning to the Diamond Rock squadron whereupon he was immediately promoted to commander of the prize. Sadly, Reynolds was never able to take up his new command, he did not recover from his wounds, and died eight months later. Robert Carthew Reynolds was buried with full naval honours on Diamond Rock, the only man ever to be interred there. Despite the large numbers of naval and military personnel who died of fever in the eighteenth and nineteenth centuries, only one of the Indefatigable young gentlemen died as as a result of disease. Philip Frowd, a relative of Pellew’s wife Susan, was lieutenant of the frigate Blanche when he died of fever in Jamaica in 1804 at the age of 25. Frowd’s elder brother, Anthony Edward, a naval surgeon, also died of fever at the same time and the two are buried together in Port Royal. 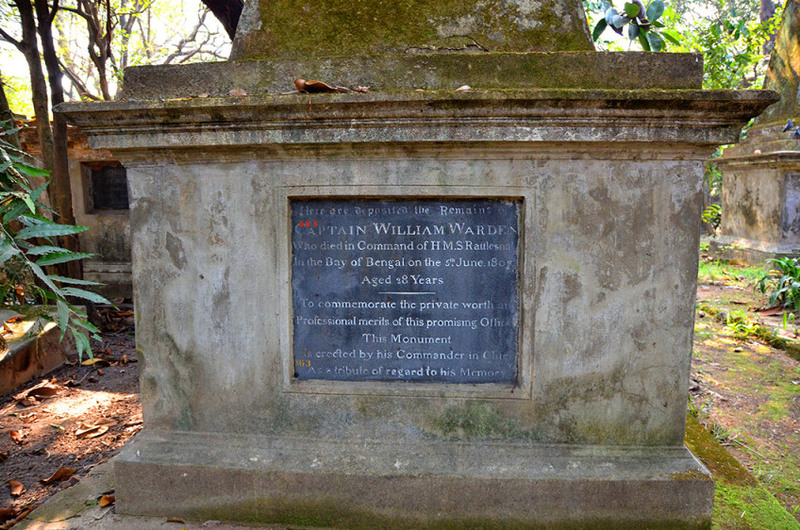 As to be expected, the rigors of the sea service also took their toll and two of the cohort, James Bray and William Warden, died of shipwreck and exposure at sea. James Bray had a rather unusual family background for a Royal Naval officer, although he was born and brought up in Falmouth were his father was a doctor, his family originally hailed from Ireland and were prominent Roman Catholic scholars and clergy who also held lands in France. Bray served throughout the French Revolutionary and Napoleonic Wars before being lost in the wreck of the hired armed cutter Plumper in Dipper Harbour off New Brunswick in December 1812. The second of the Indefatigable’s young gentlemen to die at sea was William Warden. Warden was born in Lisbon where four generations of his family had lived and made their livelihood, first as ship builders and later as merchants. Warden served with Pellew throughout his career and accompanied him to India, when Pellew took up his commission as Commander in Chief of the East India Station in 1805. Warden had just made post captain in 1807 at the age of 28 and was commanding the sloop Rattlesnake when he died of excessive fatigue and exposure in the execution of his duty, during a violent gale of wind on a passage from Madras. Pellew was deeply moved by Warden’s death and erected a handsome memorial to him at Calcutta, which can still be seen today. As a group, the Indefatigble’s midshipmen went on to serve in many notable naval actions and engagements throughout the French wars and beyond, including Trafalgar where the Scots Alex McVicar and John McKerlie served as lieutenants of the Minotaur and Spartiate. Other notable actions that the Indefatigables participated in included expeditions to Quiberon Bay and the Scheldt, actions at Batavia roads, Cuxhaven and Heligoland, and the Bombardment of Algiers. All but two of the Indefatigable’s young gentlemen went on to become commissioned officers, the exceptions being George Chace and John Gaze, who both had long and successful careers as warrant officers. In January 1797 George Chace was the most senior of the Indefatigable’s junior officers, and he also served as captain’s coxswain at this period. Rather than following the commissioned officer career path, Chace went on to become a master gunner, and served in this capacity for almost thirty years. John Gaze initially served as a midshipman aboard the Indefatigable, however he was serving as acting master at the time of the Droits de L’Homme engagement. Following the action, he received his warrant and his promotion to master was confirmed. Gaze served his entire career alongside Edward Pellew accompanying him to India and the Mediterranean and serving as Master of the Fleet at Algiers. Later Pellew helped Gaze to secure the post of Assistant Attendant of Portsmouth Dockyard, before he went on to serve as Master Attendant of the Dockyard at Sheerness for ten years from 1836 to 1846. On his retirement, Gaze was promoted to the rank of Master and Commander, a rare honour awarded to few warrant officers. Gaze was Pellew’s closest seagoing confidant, and continued as a friend of Pellew’s family after his death. Henry Hart served in a number of diplomatic roles in his post-war career, in 1818 he was sent to Panama to help safeguard British interests, and later in 1834 he undertook diplomatic missions to Muscat. Hart’s diplomatic efforts were so successful, that the Sultan of Oman presented him with a fine teak ship for King William IV. Hart was knighted for his diplomatic services in 1836. Jeremiah Coghlan was also involved in diplomatic service in South America at the time of the treaty of Montevideo, although his relationship with the Minister Plenipotentiary in Rio was fraught to say the least. Two other Indefatigables, George Cadogan and Nicholas Pateshall were also responsible for carrying important personnel and despatches during the Peninsular War and the aftermath of the War of 1812. The Charts and Plans Referred to in the Report from the Committee Appointed to Examine into Mr Telford’s Report and Survey, 15th June 1809. Like many young naval officers, several of the Indefatigable’s midshipmen became involved in technological innovation both within and outwith the service. 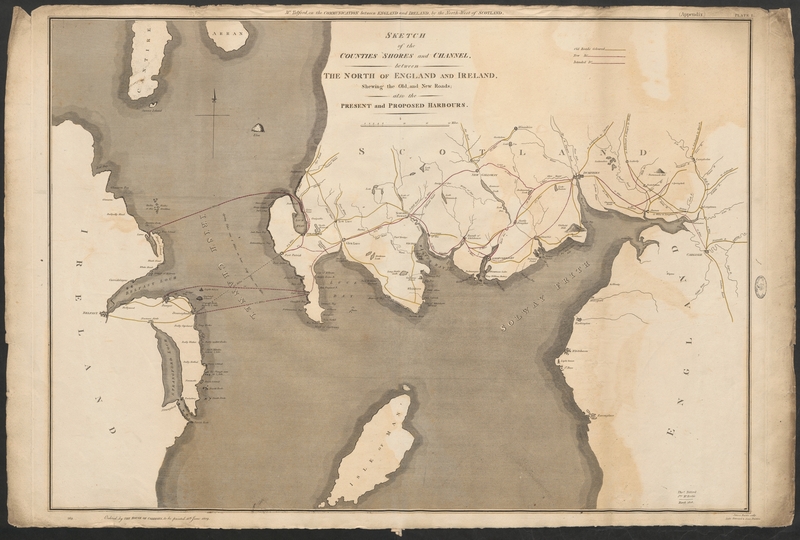 John McKerlie was seconded from the navy between 1806 and 1808 to work with Thomas Telford surveying harbours, roads and bridges for an 1809 parliamentary report on communications between England and Ireland, via the North West of Scotland. Later, twenty years after the end of his active naval service, McKerlie had one final unexpected opportunity when he was appointed as captain of the controversial experimental frigate Vernon between 1834 and 1837. McKerlie’s fellow Scot, Alexander McVicar was also involved in technological research for the navy, in trials of new ships compassses in his home port of Leith in 1813. Two of the Indefatigables undertook hydrographical research during their naval service; in 1809 William Kempthorne charted extensive and dangerous coral reefs in the South China Sea, and following his diplomatic mission to Muscat in 1834, Henry Hart published detailed navigation notes on the southern passage to the islands of Zanzibar. Hart also demonstrated a knack for technical invention during his civilian career when, in 1849, he patented a device to prevent chimneys from smoking. The device was employed at Greenwich hospital, where Hart happened to be one of the commissioners at the time. Those of the Indefatigable’s young gentlemen who survived the war lived on to experience the transition from decades of conflict to lasting peace, and were among the first generation to live at peace for many years. With the navy being drastically reduced in size, opportunities for naval officers were few and far between after the end of the Napoleonic Wars and most had to forge new civilian careers and occupations ashore. Like many of their contemporaries, the Inedfatigable’s former young gentlemen, carried the experience they gained during their naval service into the post-war period and they continued to serve in public offices and charitable institutions in the towns and cities where they built their civilian lives. Some remained in maritime occupations at the end of their naval careers; John Thomson took up employment with the coastguard service in Ireland. Alex McVicar served as Admiralty Commissioner for the Harbour and Docks of Leith from 1826 onwards, John McKerlie built and operated merchant vessels out of the port of Garlieston in Galloway in the 1820s, and George Tippett became a packet captain after being invalided out of the service early in his career in 1810. Others took up public office and entered local and national politics. 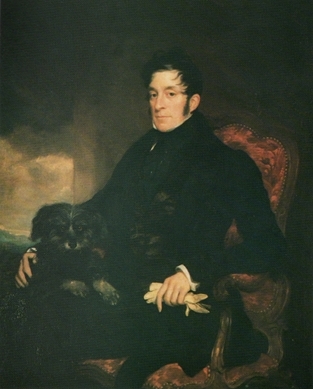 The Hon George Cadogan took his seat in the House of Lords in 1831 and inherited the title 3rd Earl Cadogan from his brother the following year. Cadogan was an active member of the Lords who supported a number of causes that threatened to impact on the rights of landowners and rural constituents, including the extension of the railways and the repeal of the corn laws, legislation he vehemently opposed. Thomas Groube and Nicholas Pateshall entered local politics, both were Whigs but Groube was markedly more radical. Groube had a long and active involvement in local politics in Honiton, Devon, where he was elected to the new civic role of alderman and the historic office of port reeve. Groube campaigned on a number of radical issues such as the repeal of the Corn Law, which unlike his former shipmate, he strongly supported, the imposition of income tax and issues of church politics. His radical stance on these issues was influenced by his membership of a dissenting congregation. Groube came to be respected for his warmth and generosity and, following his death in 1850 at the age of 75, he was remembered in the press as being a “true friend of the poor man” . Though considerably less radical than his former shipmate, Nicholas Pateshall was also involved in local politics. He held the office of mayor of Hereford several times from 1840 onwards and was remembered for his good humour and tolerance. As might be expected of respected men of the standing and retired naval officers, several of the Indefatigables also served as magistrates later in life, including Nicholas Pateshall, John McKerlie, and John Harry. Many of these men also became involved in supporting charitable causes and institutions. Unsurprisingly, naval and maritime charities were popular causes for retired naval officers, though their commitment typically depended on their social status and disposable income. George Cadogan, Henry Hart and William Kempthorne all supported a wide range of naval and maritime charities including the Marine Society, the Seaman’s Hospital and Royal Navy Club. Many of these causes were also supported by their former captain, now Admiral Lord Exmouth, who subscribed generously to many maritime causes. Pellew, Henry Hart and John Thompson were also supporters of several evangelical charities and bible societies. Hart was involved in a number of controversial charities to support destitute and fallen women, including the Fund for Promoting Female Emigration and the London Female Mission. George Cadogan’s wealth enabled him to support a wide range of charities but his real passion appeared to be for cultural causes. He was a trustee and member of both the Society of Antiquaries and the British Museum, and also supported the Covent Garden Theatrical Fund, a charity for supporting indigent and infirm actors and actresses. Cadogan was also a member of the Nelson Memorial Committee which raised a general subscription to erect a National Monument to Nelson in London, and a member of the sub-committee chaired by the Duke of Wellington, which selected the winning entry by William Railton. Throughout their naval careers, which took the young gentlemen of HMS Indefatigable to every corner of the globe, there is ample evidence in the form of Admiralty records and personal correspondence to show that they developed professional and personal networks which they maintained throughout their naval service and on into their diverse civilian lives. There is also evidence that Pellew was very much at the heart of this network and regularly passed on news of former shipmates in his personal correspondence. In addition, those officers who continued to serve with Pellew later in their careers, such as William Kempthorne who was present at Algiers, were badgered by their former shipmates for news of the Admiral. These networks and friendships persisted into the Indefatigables civilian lives. George Cadogan, Henry Hart and Fleetwood Pellew frequently met at court levées and formal naval dinners. Pellew himself kept in touch with many of his former officers right until the end of his life. Family letters from Pellew to one of his younger sons, include news of Henry Hart, who Pellew once described as a favourite of his wife Susan. Another letter was sent from Honiton, where it appears likely that Pellew was visiting Thomas Groube and John Thomson actually joined the Pellew family when he married Pellew’s niece Constantia. Perhaps the most striking evidence of the close networks of friendship that bound these men together are the condolence letters sent to Fleetwood Pellew following his father’s death in 1833. As we have already seen, these letters consistently refer to Pellew as being both father and friend. Jeremiah Coghlan wrote the following deeply moving and heartfelt tribute to his former captain. William Kempthorne, the Falmouth boy whose career Pellew had rescued, not only wrote a moving tribute to his former captain and lifelong friend, but also left instructions in his will for a diamond brooch to be made for Lady Exmouth and rings for Pellew and his eldest son Pownoll, each bearing the inscription. While I had life my heart was deeply impressed by your multiple kindnesses. Among the young gentlemen of the Indefatigable, Jeremiah Coghlan stands out not only for his devotion to Pellew and his singularly heroic entry into the Royal Navy, but also for the fame he achieved during his lifetime as a result of his naval exploits. From first to last, his life is the stuff of naval adventure and romance. Feted by the press and the public, and honoured by the Admiralty, Coghlan was the subject of numerous reports and dispatches in the contemporary press, which awarded him the epithet “Intrepid Jerry”. Coghlan’s first meeting with Pellew, on the storm tossed deck of the shipwrecked Dutton, is the stuff of legend, but like all legends, mythology has a tendency to obscure facts which, in the case of Coghlan’s early life, are few and far between. Despite his naval exploits being widely reported in the contemporary press, many details of Jeremiah Coghlan’s life are clouded by myth and remain obscure. He was born in Crookhaven in West Cork in the late 1780s, though his exact date of birth is unknown. Some reports suggested he was an orphan, others that he ran away to sea to escape an abusive mother. Coghlan’s entry into the navy was dramatic but again the actual facts are obscure and there are many conflicting accounts of the details. It appears that Coghlan first encountered Pellew while helping to rescue passengers and crew from the stricken Dutton East Indiaman, which had run aground off the Citadel near Plymouth in January 1796. Accounts vary significantly as to how Coghlan came to be present and what role he played. Some press accounts allege that he swam out to the wreck carrying a lifeline, others that he brought a boat out to the wreck to help with the rescue. However he came to be there, Pellew was sufficiently impressed with Coghlan’s conduct to offer him a place on the Indefatigable with a promise of promotion to the quarterdeck. …transported by the noble exploit performed by your friend Coghlan. The Earl ordered a gold sword to the value of one hundred guineas to be made and presented to Coghlan as a token of his esteem. This sword, which many years later was placed on Coghlan’s coffin at his funeral, still survives and recently sold at auction for a considerable sum. As a result of this action, Coghlan was promoted to the rank of lieutenant by Order in Council, despite having served only four years in the navy. Like many of his contemporaries, Coghlan disappears from Admiralty records during the peace of Amiens, however it seems that he married around this time and in 1803 his only son William Marcus Coghlan was born. Coghlan and his wife Isabella also had one daughter, named after Pellew’s wife, Susan Pellew Coghlan. Coghlan was as good as his word and after a short but severe action the privateer caught fire and blew up. Coghlan immediately ordered his only undamaged boat to be launched to rescue the “brave but unfortunate survivors”, and succeeded in rescuing all those that had survived the explosion. Jeremiah Coghlan finally made post captain in November 1810 and in September 1812 was appointed as flag captain of Admiral Sir Edward Pellew’s 120 gun flagship Caledonia, in the Mediterranean. Even as flag captain Coghlan continued his heroics and in August 1813 led a detachment of marines during an assault on five batteries defending the port of Cassis. For much of the period from 1812 to 1814 the Caledonia was engaged in blockading the French fleet in the port of Toulon. Towards the end of 1814 Coghlan transferred from the flagship to the 38 gun frigate Alcmene. He continued to serve in the Mediterranean and in the summer of 1815 was stationed in the Bay of Naples where he was instrumental in maintaining order following Murat’s withdrawal from the city. In recognition of these services, Coghlan was created Commander of the Bath in June 1815. After the end of the war Coghlan, like many of his contemporaries, found himself beached on half pay, though he appears to have received occasional minor commissions. 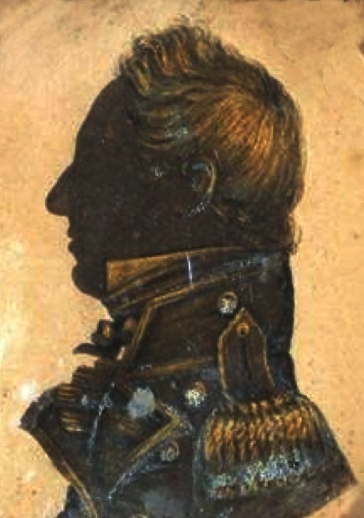 In March 1826 Coghlan received a final naval appointment when he was placed in command of the Forte frigate and dispatched to Brazil where he became senior officer at the port of Rio. There he became embroiled in a tense diplomatic incident resulting from alleged harassment of British seamen by Brazilian agents. After spending four years in South America, Coghlan’s final naval command came to an end and he retired from active service in July 1830. Few records have survived from Coghlan’s later civilian years, though his name occasionally appears alongside some of his former Indefatigable shipmates in press reports of social engagements and public events. In 1840 Coghlan was awarded an Admiralty pension of £150 per annum and two years later, he was offered a position as Commissioner of Greenwich Hospital, an appointment he declined. When Coghlan died at his home on the Isle of White in 1844 at the age of sixty-nine, he was a man of considerable wealth and his will bequeaths significant sums of money to his family. However his relationship with his wife appears to have broken down irreparably, as his will also includes the following extraordinary indictment. Coghlan’s death in 1844 was widely reported in the press, along with florid accounts of his funeral. Countless memorials extolled Coghlan’s virtues as a “most excellent and meritorious officer” and, without exception, every obituary lauded his distinguished bravery, “intrepidity, firmness and humanity”. Many also recalled his gallant service at the wreck of the Dutton and his relationship with Pellew. Of all the veterans of the Indefatigable, Coghlan is the only one whose obituaries fail to mention the Droits de L’Homme engagement; such was the mythology that surrounded “Intrepid Jerry” that his heroic exploits surpassed even this iconic engagement. The letter Edward Pellew wrote to Lord Spencer in February 1799 referred to the “boys grown to men under me” and indeed by the time he wrote these words a considerable number of the 1797 cohort had already passed their lieutenant’s examination and moved on. Several passed within days of meeting their six year minimum service requirement – there were no aged and embittered midshipmen aboard the Indefatigable! By the time the Peace of Amiens cast Pellew temporarily on the beach, all of this group had made the crucial step of passing for lieutenant. The boys who had come willingly and those who had been reluctant, the ones with powerful patrons and those with little to commend them but their own skill and seamanship, almost all became men whom the Royal Navy could rely on in battles and blockades, diplomatic missions, humanitarian rescues, and journeys of discovery. Friendships first forged in the midshipman’s berth of the Indefatigable survived years of being scattered to every corner of the globe. The network that they formed was indeed one of faithful and attached companions and at its heart was Edward Pellew, a man who could be demanding, intemperate and avaricious but who was also generous, perceptive, loyal and supportive. Tellingly, the word chosen more than any other to describe him, by those who wrote the many moving condolence letters and memorials, is “kindness”. To these writers, Pellew had been an early and lasting influence, he showed them what living out a life of duty and service should mean, and they in their turn went on to serve with courage, ingenuity and honour. 1. Edward Pellew to Lord Spencer, in Corbett, J., The Private Papers of George, 2nd Earl Spencer, Volume I, Navy Records Society, vol. 46 (NRS, 1913). 2. Nicholas Pateshall to Anne Pateshall, 17th January 1796, Hereford Archive. (Pateshall has clearly mistaken the date). 4. Edward Pellew to Lord Spencer, in Corbett, J., The Private Papers of George, 2nd Earl Spencer, Volume I, Navy Records Society, vol. 46 (NRS, 1913). 5. Robert Carthew Reynolds, 25th Sept 1797, testimony to Court Martial. The National Archives. 6. Mullié, C., Biographie des célébrités militaires des armées de terre et de mer de 1789 à 1850, vol. I (Paris, 1851). 7. Edward Hawke Locker, unpublished draft, Devon Archives. 8. Edward Pellew to Lord Spencer, in Corbett, J., The Private Papers of George, 2nd Earl Spencer, Volume I, Navy Records Society, vol. 46 (NRS, 1913). 9. Edward Pellew to Lord Spencer, 28 February 1799, Pellew Archive, Caird Library. 10. William Kempthorne to Fleetwood Pellew, 1833. 11. William Pateshall, in Tipping, M., Nicholas Pateshall: A Short Account of a Voyage Round the Globe in H.M.S Calcutta 1803 – 1804 (Queensbury Hill Press, 1980). 12. Western Times, 8 July 1843. 13. Jeremiah Coghlan to Fleetwood Pellew, 26 Jan 1833, Devon Archives. 14. Admon of the estate of Captain William Kempthorne. PROB 11/ 1850. 15. Earl St Vincent to Edward Pellew, Marshall, J., Royal Naval Biography Supplement, Part 2 (Longman, Hurst, Rees, Orme, and Brown, 1827). 16. Marshall, J., Royal Naval Biography Supplement, Part 2 (Longman, Hurst, Rees, Orme, and Brown, 1827). I’m looking to find out more about John’s family. It’s mentioned in a few places that he is related to PH M’Kerlie but I haven’t had much luck finding the link. His parents seem to be a John and Catherine and a few siblings who died in infancy but that’s about it. And none but a Seaman shall marry with me!